In 2010 the Securities and Exchange Commission adopted new rules to stamp out “pay to play” practices, a reference to the cozy relationships between some investment advisers who contributed to the campaigns of elected officials, then benefited from awarded contracts controlled by those very same officials. The crackdown has worked as intended, an example of regulations done right, argued DeCarlo McLaren, an LL.M. student at the Columbus School of Law and full time staff member to Congressman John Lewis (D-GA). McLaren is the first LL.M. candidate to deliver a Student Scholar Series presentation. 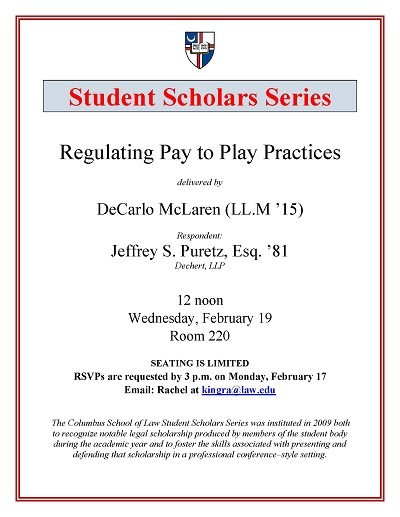 McLaren, DeCarlo, "Regulating Pay to Play Practices" (2014). Student Scholar Series. 23.